Original article by the CBC. Posted on June 9, 2018. 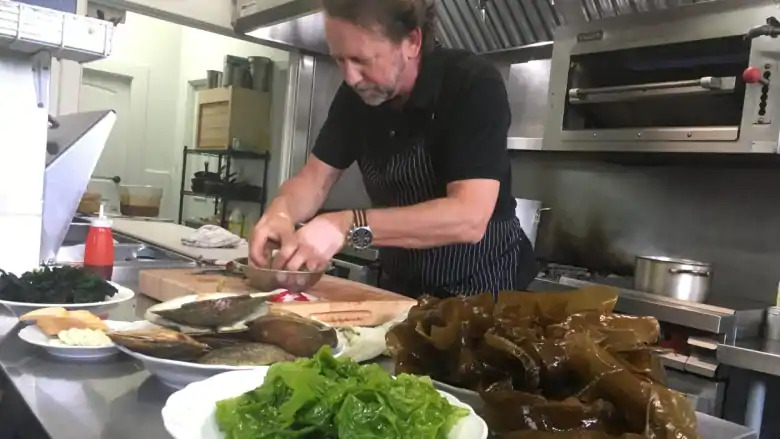 A seafood company in St. Stephen, N.B., is banking on people turning to the sea for some of their daily vegetables. The owner of Magellan Aqua Farms, Steve Backman, is considered a pioneer in seaweed farming. For the past three years, he has been growing two species of algae, sweet kelp and sea lettuce, using an underwater garden at the end of Passamaquoddy Bay. He has been working with Thierry Chopin, a marine biology professor at the University of New Brunswick. Underwater, algae and scallops grow side by side. Backman said the kelp and lettuce absorb nitrogen, phosphorus and carbon dioxide produced by shellfish. In return, they produce oxygen, which scallops need to grow. “It’s nice to integrate the culture so that extractor species improve the environment,” said Backman. Now, the company is trying to increase production to see how much capacity they have on site, while trying to figure out how to market their products to consumers.”What we want to do is be able to grow it and as we’re growing and increasing our production we’re exploring different ways to market kelp,” said Backman. The chef at the Rossmount Inn in St. Andrews, N.B., is a believer. Christian Aerni said he expects the popularity of sea vegetables to grow. Aerini said he thinks chefs just need to get creative. “If you tell someone that you’re going to live five years longer if you eat this on a regular basis, it will be very common,” he said. The sea lettuce and kelp have now become part of the repertoire in Aerni’s kitchen. Chopin said he thinks it’s time for these sea vegetables to be recognized as the “superfoods” that they are. “It’s been 10, 15 years we hear that seaweed is the next superfood,” he said.